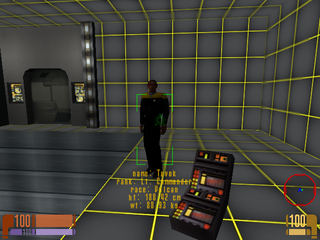 Star Trek Voyager: Elite Force is a high-quality FPS game based on the Voyager television series. NOTE: This article does not cover the game with the Virtual Voyager expansion installed except where noted. A usable tricorder can be summoned using the console, or briefly obtained through normal gameplay in one out-of-the-way location detailed below. The tricorder gives you a sensor display to the bottom right with dots representing friends and foes, and describes what you point at in more detail with the left mouse button. This would have been intended to be used by the player at some point, unlike the rest of the NPC weapons. It is not selectable by weapon cycling or by pressing the T key as its icon implies. 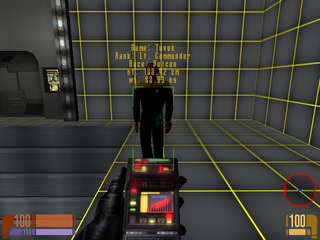 The tricorder would be finished up late and made officially available in the Virtual Voyager expansion, where it was finally selectable by pressing T.
This item is also in the PlayStation 2 version and looks like v1.0's tricorder, except the sensor mode is broken with a few symbols appearing at the top left of the screen. Like the tricorder but far less polished, a usable hypospray weapon can be found. The primary trigger fires a spray of blue particles. Using the alternate fire shows it's clearly unfinished by only spraying at an extremely high rate without sound. It also has an early icon, showing a different font. It is not selectable by using the weapon cycle or pressing the H key as the icon suggests. Due to the name of the pickup being "health hypo", attempting to give it to yourself by cheat will parse "health" and the letters as a negative number, killing yourself in the process. This broken item exists in the PS2 version, broken altfire and all. 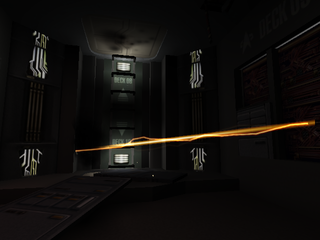 In VOY6 ("Renewal") at the start while in the sickbay, head to the room on your right, go towards the wall panel (a doctor will walk here and poke it), use it to unlock the drawer at the bottom on the wall to your left, crouch and use the drawer. It will open and you will find a tricorder and a hypospray. For some reason these obviously unfinished items can be picked up in their broken state here, without cheats. Mistake? Easter egg? Cut quest items? Who knows. These two items disappear from your inventory after you take the turbolift. 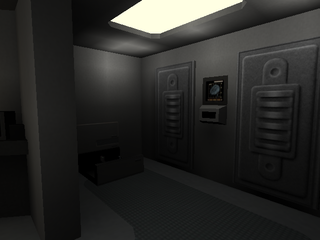 In the Virtual Voyager expansion's sickbay, this drawer remains with the still-broken hypospray item, and the panel has been moved to another wall. This secret is also in the PlayStation 2 version. There is an inaccessible room around where Renner is running from. You can't get there because there are explosions that will cause a game over, and a forcefield you must turn on to continue, blocking your way. In that exploded hallway lies a room with two closed hatches and a large yellow electrical zapping beam which damages. In addition, there is a broken turbolift that leads to nowhere but death. Federation4.jpg is the insignia for the United Federation of Planets with a crude 4 painted over, presumably for editor marker reference for scripts. 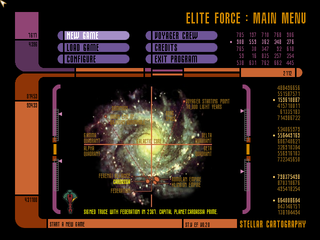 It is only referenced by VOY5.BSP and is not seen in-game, with Federation.jpg used instead. There are leftover textures for the 'bloodexplosion' shader (originally used by Quake III Arena for indicating a hit with an animated sprite). All blood inflicted is removed from the final release. The last frame is erroneously a duplicate of the second. Like Quake III Arena, Elite Force contains a sun flare texture and loads it, but has no way to draw it. All of the skies used are starfields or at night, so it would have been inappropriate anyway. The file is exactly identical to the unused sun in Quake III Arena. The single-player and holomatch modes are separate applications, with their Finder icons kept unique by differing creator codes: ElFr for single-player, and EFrc for holomatch. Both applications contain the icons and other data associated with both codes, as well as a third owner resource (VoEf) that goes unused by either. While the ElFr and EFrc resources are empty, the VoEf resource holds 256 bytes of data in an unknown format. The resources also define two document types with their own icons, ElFb and ElFt. We can infer from the icons that "b" and "t" stand for "binary" and "text"... but all of the game's data files are of type ElFb, leaving the "text" icon unseen. It might have been meant for the settings file mentioned above, which was instead left as a SimpleText document for convenient hand-editing by those daring enough. The ElFb/ElFt types and icons recur, unused, in American McGee's Alice (another id Tech 3 Mac port from Westlake and Aspyr). The minimal menu bar usable in dedicated server mode is kept unchanged from Quake III Arena, including the still nonfunctional 'About' command. This page was last modified on 2 June 2018, at 19:18.